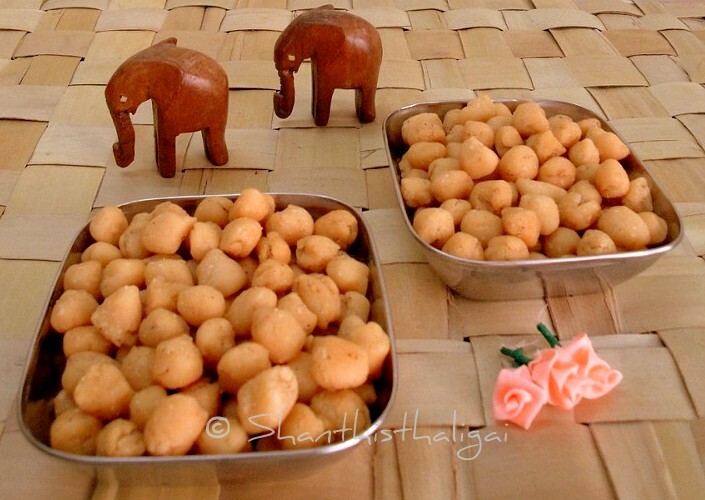 Seedai is an offering made for Sri Krishna Jayanthi/Gokulashtami. Usually, seedai is done with processed rice flour. Earlier I have posted uppu seedai, maida coconut milk seedai. Now I have used wheat flour instead of maida. The gluten content in wheat breaks down when steamed and makes it easily digestible and healthy. Urad dhal powder - 2 tsp. Prepare urad dhal powder as said in this link. Tie wheat flour in a clean white cloth and steam cook for 15 minutes. When still warm to handle, break well without any lumps or powder in a mixie. Sieve well. Sieve rice flour and dry roast until hot. Mix water and coconut milk and keep ready. Melt butter and keep ready. In a broad vessel, combine all ingredients and mix well to a crumbled mixture. Now add the water-coconut milk mixture little by little to make a smooth dough. Make small balls from the dough and spread it on a clean, white cloth. Heat oil and add the seedais to it. Deep fry in medium heat until golden brown. Drain on a kitchen towel. When cool, store in an airtight container. Crispy and crunchy wheat flour coconut milk seedai is ready for offering. Click here for regular seedai recipe. Click here for maida coconut milk seedai recipe. Make sure that there is no mud or dust in the flour, sesame seeds, jeera and salt. It is better to dissolve salt and hing in water and strain it and use. Grated coconut is not necessary as coconut milk is used. Coconut oil enhances the taste, but any other edible oil can be used.